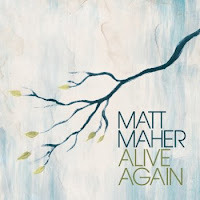 Matt Maher: Life-Changing New Album 2 : Reform worship. I wanted to give it another couple weeks before reviewing this album to avoid prematurity. I'm glad I waited...because this post will now reflect two more weeks of me soaking in this beautiful creation. Allow yourself to enter the world of this work of art, and I'm pretty sure you too will have a life-changing experience. The storyline of the entire record goes something like this: God comes and saves us from ourselves and our world of fantasy, opening our eyes to the reality of our sin and His love, which He demonstrated to us in Christ's death and resurrection, calling us out and taking us in as His beloved children. This is a Gospel album, and I'm not talking about the music genre. The album opens with a song that presents the framework for the story that follows. There is more than just radio-friendliness in track 1, "Alive Again". Listen carefully to what Maher is painting here - fantasy and reality. In the midst of our busy preoccupation with our sinful fantasies, God's shout breaks through with the reality of His love, waking us up again. Instead of fantasizing over worldly things that will never satisfy, God wants us to see through His eyes that he delights in us and wants to satisfy us as His children (track 3, "Sing Over Your Children", one of my two favorite songs on this album). This love we receive from the Father pushes out all desire for material things and temporal fixes, and it holds us together as the Church (track 4, "Hold Us Together"). We then hold up this banner of love, the cross, for the world to see, so that everyone everywhere might be drawn to Jesus Christ (track 5, "No Greater Love"). Tracks 4 and 5 are fun songs. This chorus is from track 6, "Love Comes Down", my other favorite song on this album. You have to hear the melody of this chorus with the words to get the full depiction of the incarnation imagery. I breathe deeply and smile in wonder and worship every time I hear it. Maher's music style is nothing fancy, pretty common among contemporary praise and worship music. It's light and minimal for the most part, including a couple very raw vocal songs (tracks 9 and 12), and it certainly does not hinder his storytelling. There are definitely some unique melodic and instrumental moments. I think immediately of the bell/piano riff in track 11, "Christ Is Risen", which, for an Easter song, has almost a Christmas feel. And his chorus melody in track 10, "You Were on the Cross", would have knocked my socks off were it not strikingly reminiscent of Keane's "Somewhere Only We Know". Nonetheless, the symphonic arrangement at the end of that song alone is worth the $9.99 I spent. Overall, I feel his music accompanies the message nicely, and the music by itself is at times an expression of true beauty. We will be trying out "Sing Over Your Children", "No Greater Love", and "Remembrance" in our Sunday gatherings. Most of the songs could be used congregationally, though.